MONCTON, N.B. 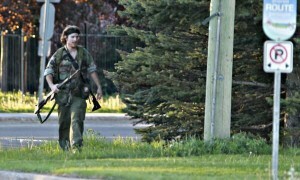 (Canada)— Residents spent Thursday hunkered in their basements as hundreds of police officers from all over the province hunted a young man suspected of shooting five RCMP officers, killing three of them. The city remained in a “very, very dangerous situation,” Cpl. Chantal Farrah said during a news conference late in the day. Officers looking for Justin Bourque, 24, locked down an area in the north part of the city Wednesday night and continued to urge residents to stay locked inside their homes Thursday. “It has been perhaps the darkest day in the history of the New Brunswick RCMP,” Commanding Officer Roger Brown said. Earlier in the day, police descended on a rooming house but then dispersed about two hours later and wouldn’t comment on what happened. The suspect was last seen around 8 a.m. Thursday, Codiac RCMP Supt. Marlene Snowman said. An earlier report of a sighting proved to be unfounded. He encouraged residents to remain vigilant and to call police if they spot the suspect. “He is very mobile and still considered very dangerous, armed and dangerous,” Brown said. Police responded to a call at about 7:20 p.m. Wednesday of a man walking down the street carrying firearms. Three of the responding officers were shot and killed. Two others sustained non-life-threatening injuries and were taken to hospital. One remained in stable condition late Thursday, while the other had been released. Police didn’t release the names of the deceased and injured officers.